Home seen through a stereoscope. "This beguilling, intelligent sequence of poems is set in Coventry, home of the famous titular-so to speak-character. Gold Coaster Guilar divides the book into one section dealing with Godiva's story, including Peeping Tom, and another imagining the experience of migrants in Coventry after WWII." Watching Richard’s film: wondering who is this guy wearing my coat? I’ve never watched myself before. Well, I’ve watched footage of kayaking, but that’s automatically critical: head position, boat edge, hands, paddle shaft…is the roll still boat body head…and more often than not..what was I thinking taking that line? But here, how strange to be both speaker and audience, to be a critical observer of one's own actions. Maybe technology makes talking to oneself acceptable. The camera hands me a version of myself. Perhaps I recognize it. Perhaps, like the way it seems to distort the size of the cathedral ruins, the length of a cobbled lane, it gives back a version that is one of many. This happens when someone reads what you’ve written. The text invents a version of the writer that the writer may not want to own or recognise. So I’m waiting for the local paper to review the book, wondering what version it will put in the public space. And so to see Mr. Cohen in concert. There’s a character in the second part of Lady G who lives in his own little room, insulated from the world by his record collection. I knew people like that. Cohen’s songs I have known since at least 1975 and they have performed a kind of commentary/sound track to all the years in between. I never understood people who thought the songs sad or depressing. True he didn’t write the best jingles when it came to tunes. But I would have characterized his songs as private. One recent commentator called it “music of the solitary heart’. The allusions in lady G are to Paul Simon and Bob Dylan but it could just as easily have been Cohen’s music. It comes then as a familiar shock to find myself in a crowded venue, looking at all the ages and shapes milling round after closing time, thinking that for many of these people this was something far more personal than “just another concert”. Lenny Bruce somewhere says there should be tv screens in hotel rooms so you could advertise your loneliness and find someone in the floors above or below who felt the same way. I wonder how many of the crowded audience had listened as adolescents to those songs, thinking they were alone, wondering what it would be like to find someone who understood, only to discover a hall full of people who had felt the same way. I was lucky to be in Dublin for the Planxty reunion gigs. Same feeling, like heading out of Tashkent in the early morning to Samarkand, genuine Christmas morning excitement balanced on the possibility of a terrible disappointment. And then these four scruffy looking Herberts ambled onto the stage at The Point and proceeded to open up a musical space most of us only dream about. When Liam O’flynn strikes up the pipes, it’s an invitation to something that is so old that it seems preverbal, beyond any kind of public or private distinction. Like the song lyrics and the structures the others add; this is an art that is approaching primary colours, like folk tales, like fairy tales, like the big songs Martin Carthy or Martin Simpson perform, something that allows for the most powerful of emotions to be made public: taken unflinchingly into a public arena where they can be understood and shared. I saw a documentary where someone described Planxty as “playing chords in the soul” and while I’d usually flinch at such melodrama it strikes me as being a good description. I’m not sure what this means, or where it’s going, but there are two different art forms here, coming from the same place, but moving out in very different ways. In one the song or the tune belongs to all of us. It’s our heritage, and we go to see the musicians to admire their skill, to enjoy their performance, revere their respect for the material. They make what is ours available to us again. A communal understanding is re circulated outward into community. There are variations on the tune but the tune is common to us all. The other is personal, it says “this is how I felt“ and offers the statement and invites you to acknowledge the familiar in the other. To move from I towards we. But the magic is how one person can do that. Can take responsibility for meaning so very much to so many different people. The difference between Old English poetry and Frost at Midnight? Before I burble my way into embarrassment. I chickened out when this was published and left the dedication off. So now might be a time to recover the loss. Dorothy Porter died while I was in England. Mostly unnoticed by the English press. I never met Porter, so it's not a personal loss, but The Monkey’s Mask is probably the most enjoyable poetry book I’ve read. Why does it feel so awkward to write that? Is it because a literary education is about learning to evaluate and appreciate and analyze, where everything has to be weighed and measured and any statements needs to be qualified, with any kind of certainty or personal response disappearing down an endless chain of subordinate clauses? Is the lack of opportunity to sound clever or to do the critical performance with text as launching pad? 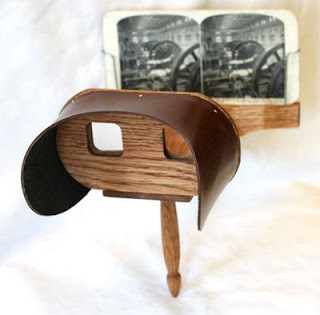 In the Herbert there’s a Victorian Stereoscope. You look through the eye piece at two almost identical pictures and the lens moves them together so that you see the scene in three d.
For anyone who either grows up in a migrant community or migrates, Home is always an odd word. We could get the bus home from the library and my father would tell me stories about home which were about a totally different place. So the slide labeled “home” is not two identical scenes that can be transposed over each other to give an illusion of depth, but two completely different pictures linked by the accidents of biography. The place I came from, personalized with my own life stories, by the fact that experiences happen somewhere and memories of that place are coloured by the memory of the experience. Coventry my not be the most beautiful city on the planet but a lot of good things happened there. "Home" where I grew up, forever “back” in past tense. And home. Where I live now. When I look through the eye piece at the slide labeled Home, instead of one three d picture, I see a strange imposition of one scene over the other, so neither can be seen entirely clearly. I used to think this was a bad thing. Now I think it's an interesting perspective.